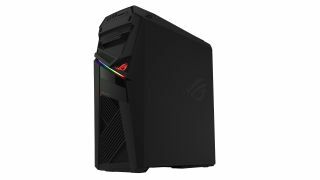 Another Asus gaming machine has been revealed under the bright lights of CES in Las Vegas, and in this case it’s a beefy desktop PC. The ROG Strix GL12 is a gaming PC built around Intel’s latest 8th-gen processors, with the rig being capable of taking a Core-i7 8700/8700K (six-core with Turbo up to 4.8GHz), or a Core i5-8400 CPU. That’s backed up with one of Nvidia’s GeForce GTX 1080 graphics cards, and 8GB of DDR4 system RAM (running at 2666MHz). Storage includes options on up to a 512GB PCIe SSD, and up to a 2TB hard disk. Asus further notes that this rig has an easy-swap SSD tray to make upgrading storage a dead simple affair. The company describes the design as ‘unconventional’ and ‘aggressive’, with angular aesthetics, and a somewhat bulging look at the front – it’s likely to be a bit of a love-or-hate affair. The ROG Strix GL12 also has a transparent side panel along with Aura Sync customizable lighting, which allows for the lights on the front of the machine to be lit with over 16 million possible colors (complete with a number of preset effects). Aura Sync, as the name suggests, allows you to synchronize lighting effects with other peripherals that support the tech (keyboards, mice, headsets and more – see later in this story). The Asus ROG Strix GL12 will go on sale in April, although pricing has yet to be confirmed. The company further revealed a batch of fresh accessories, headed up by a new gaming keyboard. The ROG Strix Flare is an RGB backlit mechanical gaming keyboard that uses Cherry MX RGB switches. It also has a bank of media keys – including a dedicated volume wheel – and a detachable wrist rest. Furthermore, it uses Aura Sync lighting, the same as the above gaming desktop, and offers a USB pass-through port, allowing gamers to connect a mouse (or other peripheral) via the keyboard. Asus also has further lighting innovations with a couple more ROG accessories. The ROG Aura Terminal is a compact black box that can be hooked up to LED strips mounted behind a monitor. It’s capable of detecting the colors at the edge of the monitor screen, and synchronizing the LED strips with those colors to create a ‘halo’ of lighting around the monitor for extra immersion. There’s also the ROG Spotlight that projects the ROG logo onto a wall with lighting that can be synced up with other Aura Sync-toting devices. It looks like a small webcam and has a magnetic base for easy attachment to any metal surface. Finally, Asus has produced a ‘Bezel-free Kit’, a neat bit of technology which can be used to eliminate the visible bezels in multi-monitor setups. Essentially, the kit consists of vertical lenses and mounts which are used to attach the monitors together (at an angle of 130-degrees), using clever light refraction techniques to make the monitor edges seem to disappear. It’s easier to see the results rather than explain them – check the above image. All of these accessories are set to become available in the first half of 2018, although no prices have yet been mentioned.